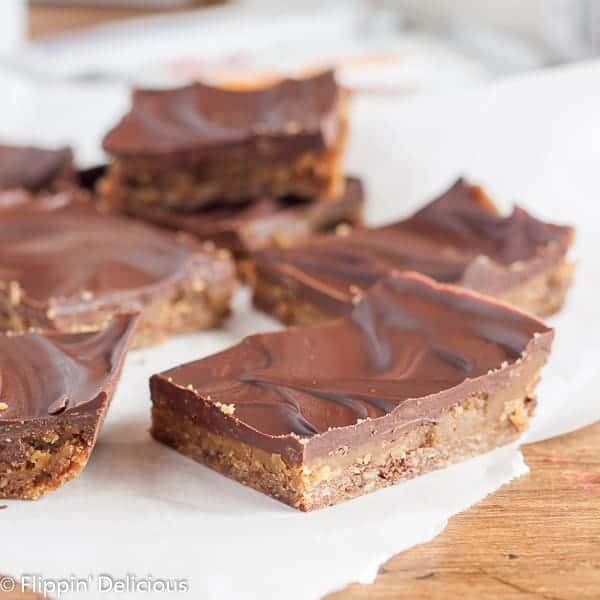 No-Bake Millionaire Bars are a cinch to make and they are gluten-free, vegan, and rice-free. They are the perfect easy treat to tuck into a lunch box. This post is sponsored by Enjoy Life Foods. All opinions are entirely my own. I am a pretty big fan of their products and company! 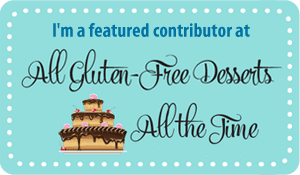 Not only are all of their products gluten-free, but they are all free of the top 8 allergens (dairy, eggs, wheat, peanuts, soy, fish, shellfish, tree nuts) AND casein free, sesame-free and free of sulfites. Everyone is my entire family can enjoy Enjoy Life Food’s products! (and I can never keep enough of their Plentils on hand to satisfy my hubby’s cravings.) Thanks for supporting Flippin’ Delicious™ and the companies that I work with! The start of school snuck up on our family this year. Somehow, I have a kiddo who is old enough to go to elementary school, which blows my mind! I packed snacks and lunches for her in her first year of preschool, however last year she had free lunch at school and making me out of lunch-packing practice. The night before the first day of school I realized how rusty I was as I scrambled to pack a complete meal she would actually eat. Luckily, I have some very talented friends who have been packing lunch-boxes for years, (Vegetarian Mama, Keeley McGuire Blog, Cupcakes and Kale Chips, & Gluten-Free Palate) and I have a pantry well-stocked with gluten-free snacks. 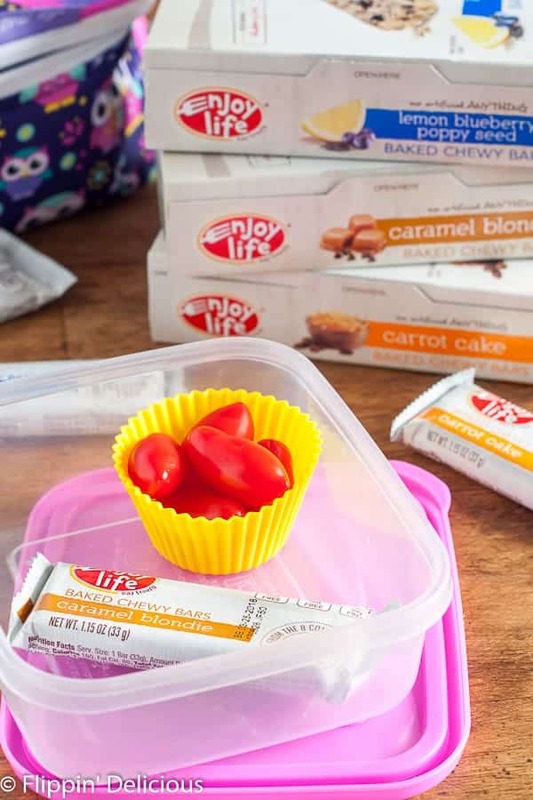 Armed with tips from my blogging friends, I packed a lunch box with, baby ‘matoes, Enjoy Life Foods NEW Chewy Bars, a bag full of Plentils, and a sunflower seed butter and jam sandwich. I felt funny sending such an allergy-friendly lunch with the one person in our family who actually has no special dietary needs. Over the course of the week, my little person tried all of the new Enjoy Life Foods NEW Chewy Bars. There are 3 new flavors; Blueberry Lemon Poppyseed, Caramel Blondie, and Carrot Cake. 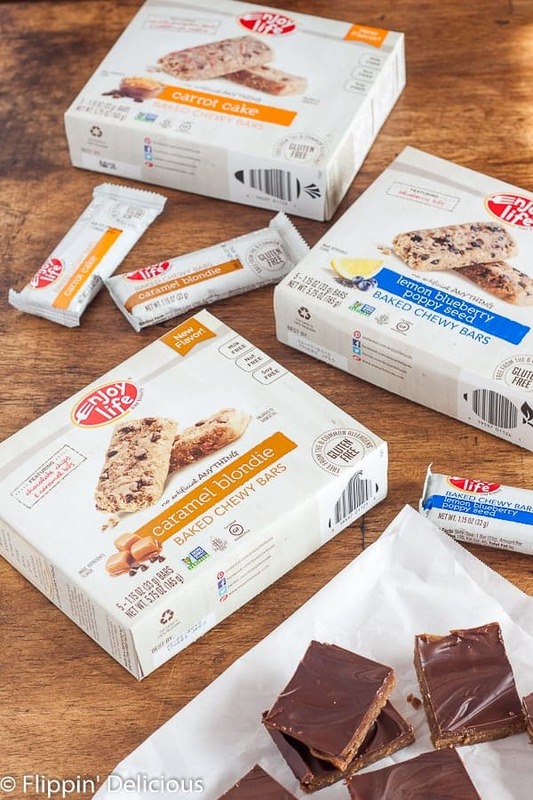 The new Chewy Bars are 15% bigger than the original 4 flavors and they are top-8-free (as are all of Enjoy Life Food’s products). They are also made with Enjoy Life Food’s new Pure Life Balanced Dry Blend™ flour, which is made from sunflower kernels, cassava flour, sorghum flour and quinoa flakes. Later in the week, as I got my stuff together a little bit better and I made a special treat for E’s lunch box. 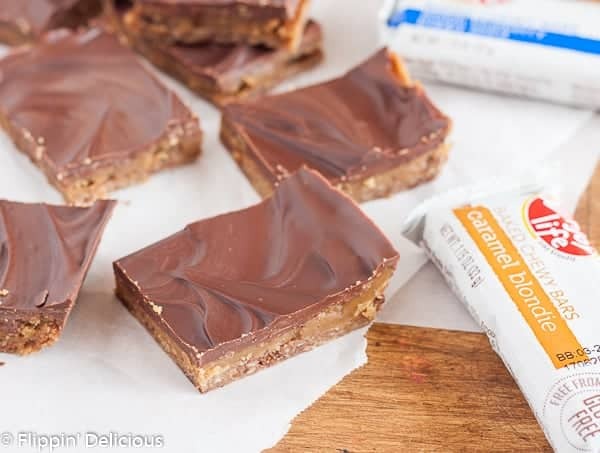 I made the easiest vegan gluten-free no-bake millionaire bars using Enjoy Life Foods Caramel Blondie Chewy Bars and tucked one in her lunch box. 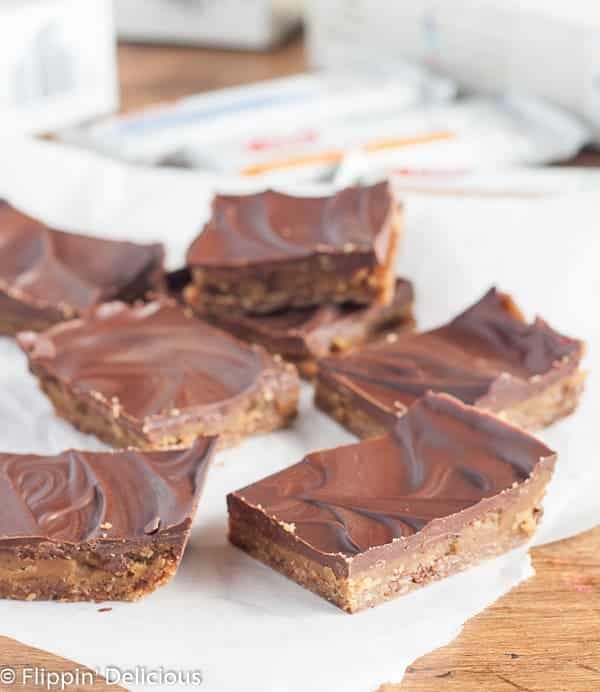 The dairy-free caramel bits and Enjoy Life Food’s mini chips in the Caramel Blondie Chewy Bars go perfectly with toffee and chocolate! They were a cinch to make and it was a fun lunch-box surprise. 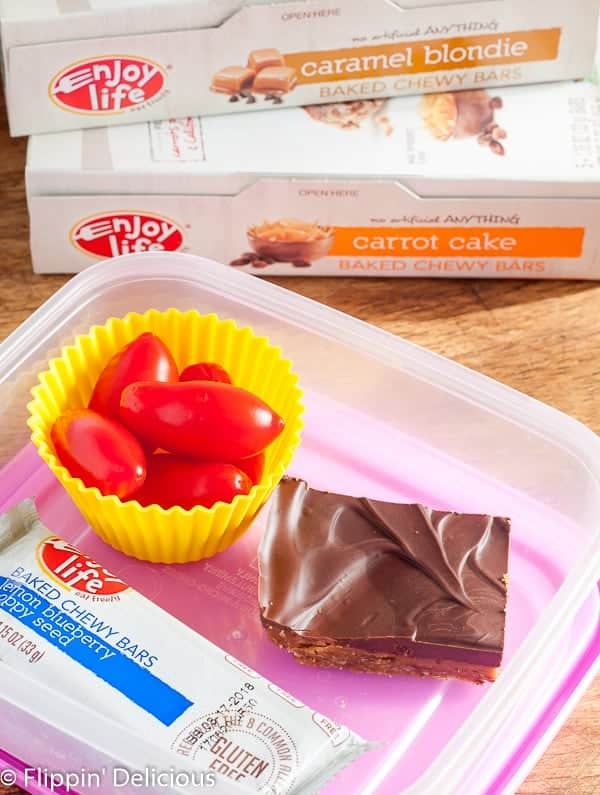 If you are looking for some other ways to use Chewy Bars as a lunch-box snack check out these Easy Gluten-Free Snack Bites my friend Amanda from My Gluten-Free Miami made. YUM! I also brought them to a work-potluck where they were devoured! As a side note, Carrot Cake was the chewy bar that was the least exciting to me…at first. It quickly became my favorite! It has crunchy pumpkin seeds so when eating it I feel like I am enjoying a nut-studded slice of carrot cake, but it is nut-free. I also got very excited when I discovered that all three of the new Chewy Bars are rice-free. I didn’t use to pay much attention to rice until I learned a co-worker’s girlfriend has an allergy to wheat AND rice. 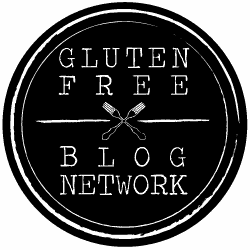 Finding gluten-free food that is also rice-free is a huge challenge, so I am always on the lookout for products that she can eat. I was overjoyed when I discovered that the new Chewy Bars are all rice-free (so I shared some with her)! 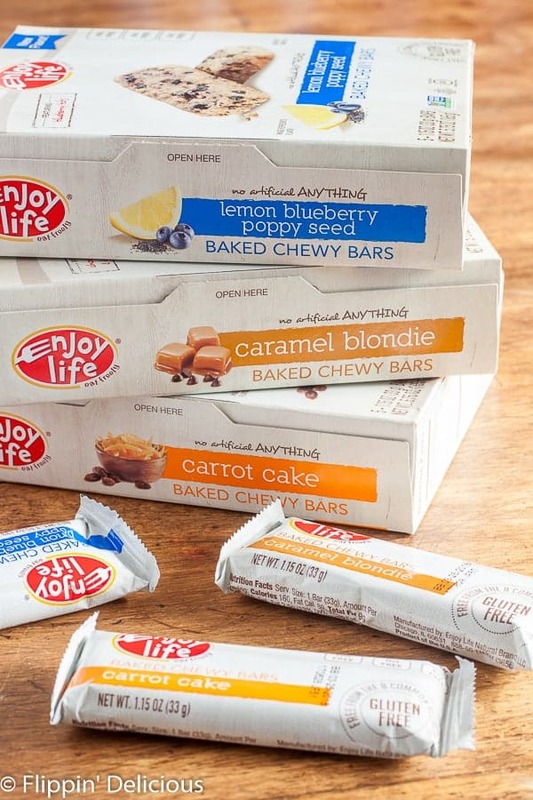 Enjoy Life Foods very generously gave me a promo code so that you can stock your pantry up with the new Chewy Bars. To order, click HERE and use promo code “CHEWYBLOG” to get 20% off single boxes of the 3 new flavors. The promo code will work through September 15th! Which one are you going to try first? Line a small loaf pan or tart pan(approximately 4"x9") with parchment paper. Unwrap each Enjoy Life Foods Chewy Bar and microwave it for 15 seconds. Immediately press it into the pan so that it is approximately ¼" thick. Place the vegan butter and brown sugar in a microwave safe bowl. Heat for 30 seconds (or until the butter is melted,) stir, and heat for another 90 seconds. The sugar should be dissolved and the mixture should be bubbly. Stir in the vanilla extract and spread over the Chewy Bars. Place about ¾ of the chocolate chunks in a microwave safe bowl. Heat in 30-second increments until melted and smooth. Add the remaining chocolate chunks and stir until they melt. Pour over the bars. Once the chocolate is set, cut into 2-inch bars.